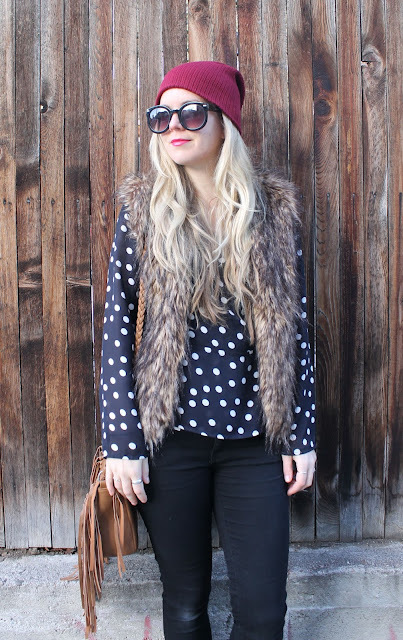 Citizen of the World: Polka Dots + Faux Fur! Polka Dots + Faux Fur! Hey friends! Oh my gosh it's been buuuusy! We had another pop up shop the other day and it was again a great success! Thanks so much to all of those who came out to say hi and support the boutique! We're already excited for the next one! We're also starting to work on getting the truck ready for spring...we are so ready to get our little mobile boutique up and running! Anyways, just a quick little post sharing my favorite faux fur vest! I recently just re-discovered it in my closet and have been wearing it everywhere. Mainly for functionality these days as it's been freeeezing out! I layer it with everything....even under my winter coat to try and stay warm! This hat I've had forever and wasn't totally loving it when I first bought it but it's definitely grown on me and definitely adds a nice pop of color and warmth to the look! Also, I'm obsessed with my black skinny jeans these days! They're super comfy and flattering! Hope you like the look and that it inspires you a little! Love you all! Thanks for following along!